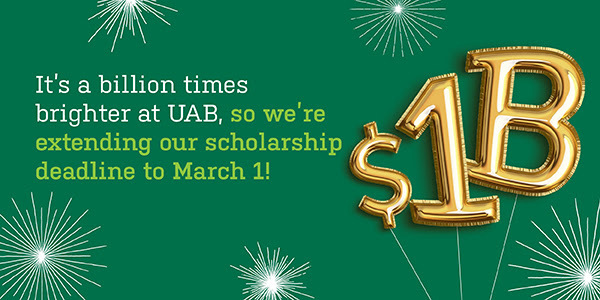 UAB extends scholarship deadline for Alabama residents to March 1st! On Nov. 28, 2018, UAB surpassed its $1 billion fundraising goal to benefit our students, faculty, patients, research, innovation, and broader UAB community. Because of this tremendous achievement, we are proud to extend our scholarship deadline for Alabama residents to March 1. Don't let your students miss out on this last opportunity for a UAB scholarship! Students can apply at uab.edu/chooseuab. If you should have any questions, please contact the UAB Office of Undergraduate Admissions at chooseuab@uab.edu or 205-934-8221. Copyright © 2018 University of Alabama at Birmingham, All rights reserved.